Is Digital Signage Good for the Environment? Going green should be a top priority of all decision makers; not only does it help the environment, but it can also help businesses save money--there also government-sponsored funding opportunities for businesses that go green. With that in mind, it’s fair to ask the question: does putting your signage on a digital display help in your effort to go green? If your building is part of the Leadership in Energy and Environmental Design (LEED), then this question is even more critical. On the surface, digital displays may not seem very green. You have to use a computer that consumes power to design signage that is sent to a display that wastes even more energy. How can your building possibly get a LEED rating with digital signage? Energy consumption of computers and displays has come a long way--the energy hogging tower computers and plasma displays are a thing of the past; today’s devices consume upwards of 90% less energy than the ones 20 years ago, and this is improving every year. LED Displays also last longer and are easier to recycle. Let’s break this down even more. Let's pretend that you have a 40 inch LED display that uses 35 watts, and you leave it on 24/7. Assuming that it's $0.12 kWh to run (the U.S. average), then that display will cost you $3.07 a month to use. Most people will put their digital displays in standby when they’re not in use, which brings down this cost significantly. You can do your own calculation to see how much you are spending with the calculator on EnergyUseCalculator.org. That sounds good, but displaying a piece of paper cost nothing, right? A lot goes into that as well. You are wasting paper, obviously (in fact, it’s estimated that 25% of landfill waste is from paper--far more than displays), and you still are using a printer and computer, which wastes energy. Using non-digital signage is also permanent--let’s say you create a display for an upcoming school dance, but then something changes. With digital signage, any revisions cost nothing. With digital signage, you can have content that’s always changing (like quotes, videos, and even games); with non-digital signage, new content requires more paper, more ink, and more workforce. Digital Signage is also more likely to communicate your message effectively. So while your using some energy, you’re using it more efficiently and effectively. Not sure if you are communicating your digital signage message correctly? Here are the 4 most common mistakes that we see with displays. Finally, when you are managing a network of digital signage, cloud-based digital signage CMS systems, such as Rise Vision, reduces the carbon footprint because you don’t have to travel to each display to change them. 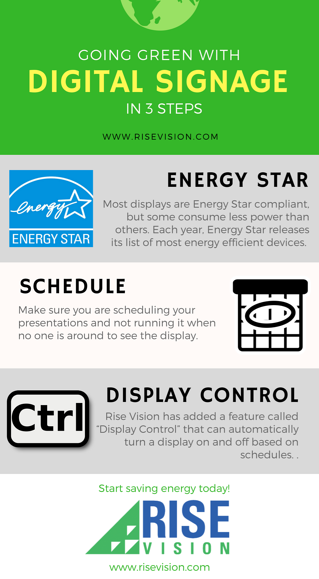 Most displays are Energy Star compliant, but some consume less power than others. Each year, Energy Star releases its list of most energy efficient devices. Make sure you are scheduling your presentations, and not running it when no one is around to see the display. Rise Vision has added a feature called “Display Control” that can automatically turn a display on and off based on schedules. Make sure you understand how it works, as this can reduce the amount of energy you are using significantly. Our Creative Team has also created several Green templates for schools and companies that want to show their viewers that they care about the environment. You can see them here, here, and here.